An Englishman in Colombia: Murphy has struck! Yesterday, I started varnishing, and did part of the table and one chair, then Murphy struck, I knew it was too good to be true, you get stuck into a piece of work, then something comes along to put the mockers on it, I received a phone call to say that the appointment for my Spinal blocker injection will be tomorrow (Thursday), and they would contact me today with the time, so that will bring work to a stop again for a few days. This morning I got stuck in again, and finished the first coat on the table, I am using a small kitchen sponge cut in two to apply the varnish, it leaves no streaks, and to ensure the varnish gets into the joints, I have my compressor on standby with the air pistol attached, then when I have sufficient varnish in the area, I blow it into the joints, in that way, if there is any shrinkage of the wood in future, the unvarnished wood should not show. Only three coats to go!! 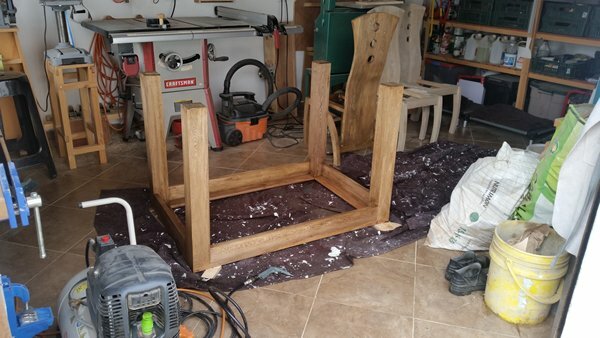 I was going to continue with the chairs, but they are covered in fine sawdust, and until the table is dry, I don't want to blow the dust around the workshop, so that's it! work has come to a standstill for a few days, I will know when I can start again after my appointment. Va quedando menos para finalizar ese comedor. Buen trabajo Phil.